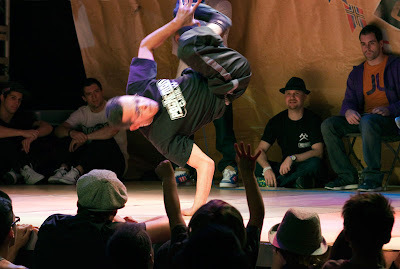 This weekend is the B-Boys championships. B-Boys or B-Girls for those who don't know is break dancing. Saturday was a lead up to the finals today. Contestants from all over the world are competing. We saw some pretty spectacular moves. The judges have a really difficult job. Megan would've LOVED to have been there. Nice shot, Mo. You don't see many B-Boys with specs like this one. The kind of thing one does a few times before breakfast. Wonderful! I think they're amazing - I could watch them for hours and still marvel at their agility, suppleness, lack of fear! I think you captured one of those spectacular moves in this photo! I hope he landed okay without breaking anything. Great move. I bet the competition was fun to watch and wonder at. breakdancing is cool. great photo and I loved catching up on all of the people shots. the festival photo is awesome too. I am glad you liked the cliff rose macro on my site. the fuzzy little hairs are hard to see and it is quite the unique plant. I've only seen it once. These kids are amazing.